Hubble Space Telescope image of NGC 4993, the host galaxy of the counterpart to GW170817. Binary neutron star mergers should have a large influence on heavy element enrichment in galaxies through their production of r-process elements. Numerous factors affect how strongly binary neutron star mergers enrich galaxies, including the time it takes for neutron stars to merge and the locations of mergers within their host galaxies. If these merger times are too long, then it may be difficult to explain the observed heavy element enrichment in galaxies. 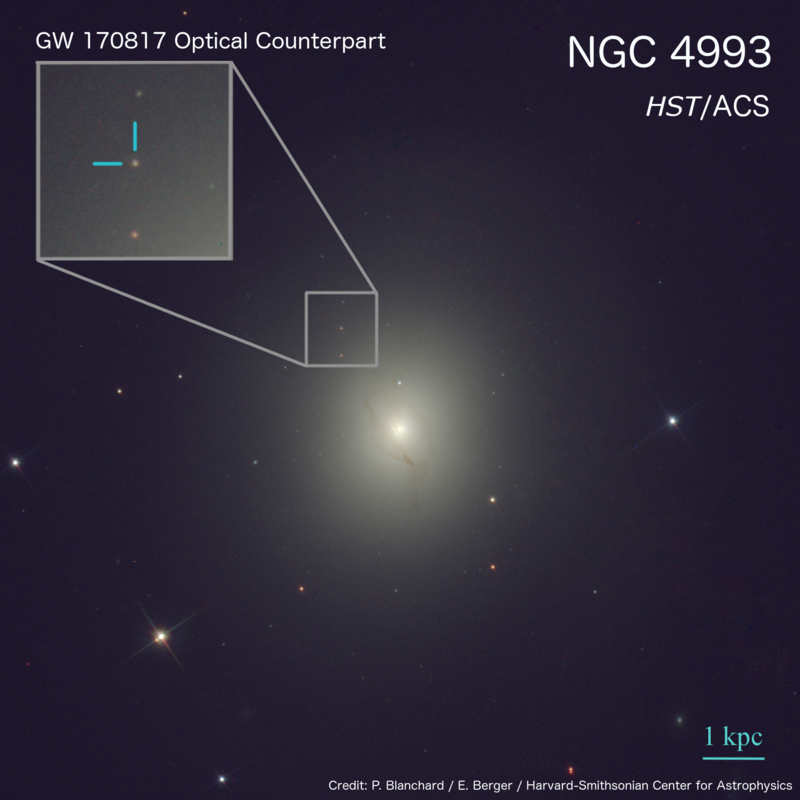 We estimate the amount of time it took for the BNS system that produced GW170817 to inspiral and merge by studying the star formation properties of its host galaxy, NGC 4993. We found that this galaxy formed most of its stars by about 10 billion years ago, and so the stars which eventually evolved into the neutron stars that merged were most likely formed in the distant past. It therefore took billions of years for the two neutron stars to merge! Such a long merger timescale implies that the initial separation of the two binary stars was at least (about) four times the radius of the Sun. We also measured the precise location of the merger within its host galaxy using the Hubble Space Telescope and found that the event is located at a relatively small offset from the galaxy center. This implies the binary neutron star system did not experience a substantial kick when the second neutron star formed. Future studies of the host galaxies of binary neutron star mergers will allow us to infer the population merger time distribution and gain insight into the formation of binary neutron star systems. Website theme “Aries” by WowThemes.net.